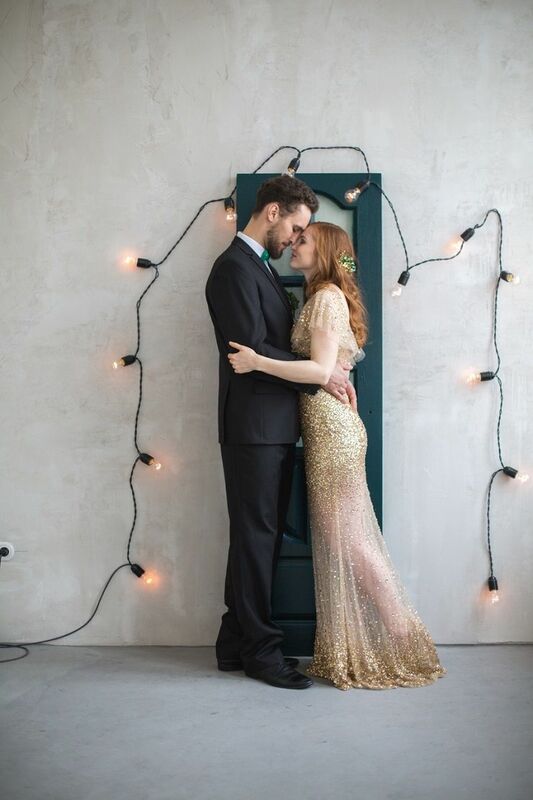 Happy New Year’s lovelies! 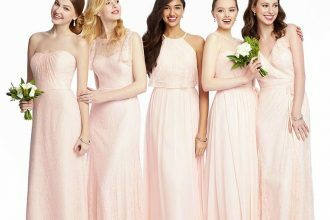 Hope you all had a wonderful New Year’s Eve and a wonderful start to the New Year 2017 today! 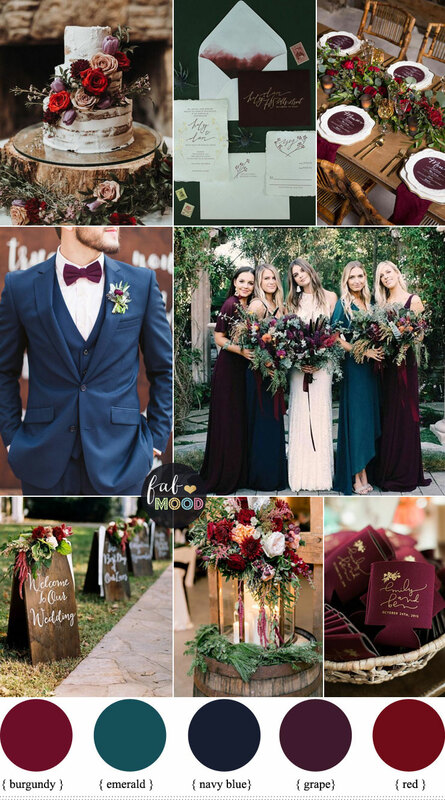 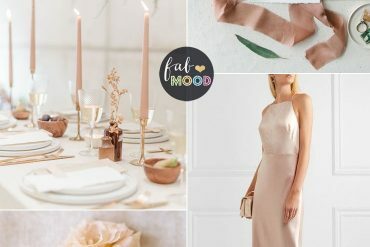 Let’s start the new year 2017 off with this beautiful gold and emerald wedding inspiration. 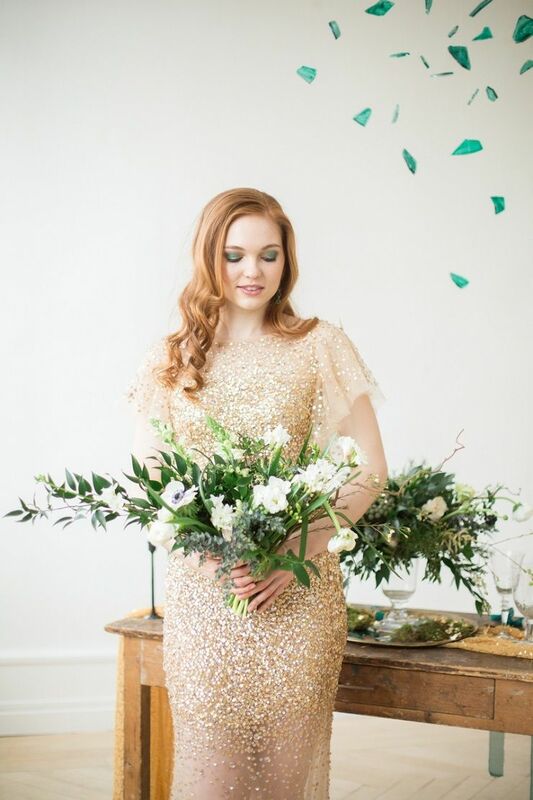 Today we are channelling the beauty of Ireland with this stunning photo shoot from Natalya Obukhova Photography. 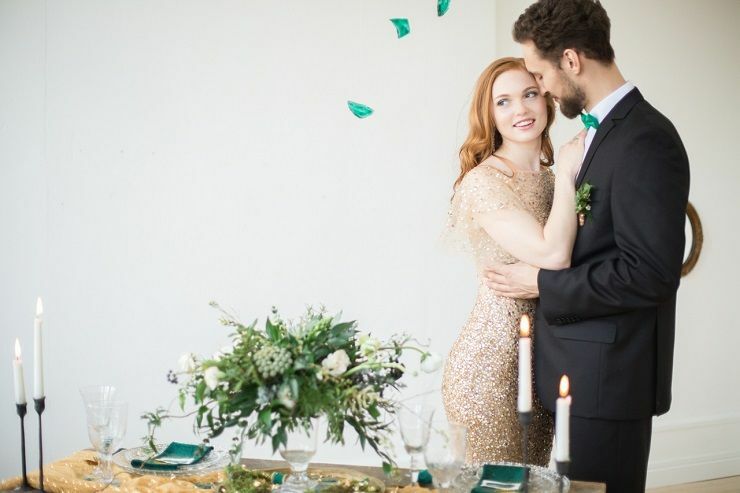 The photographer says she was instantly inspired by seeing the couple, Roman and Elizabeth with her fiery Irish red hair. 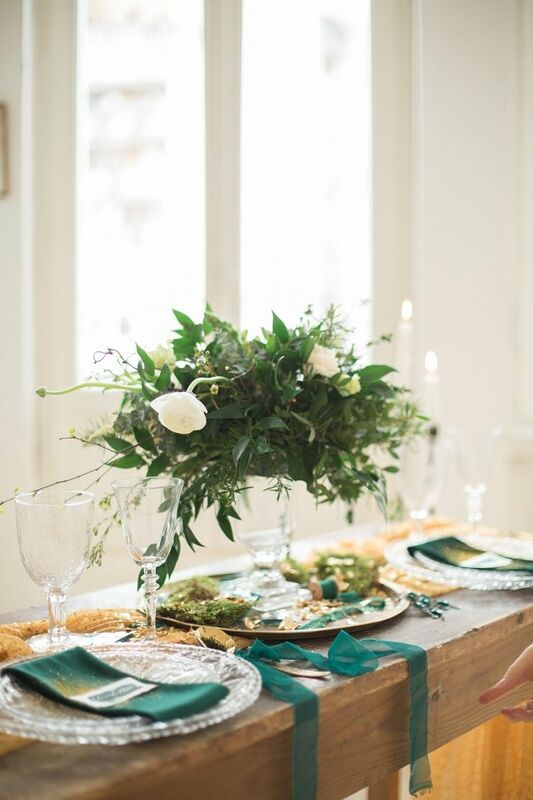 So, to play up the inspiration, the team styled the photo shoot, entitled “Emerald Fairytale”, with a colour palette driven by emerald green. 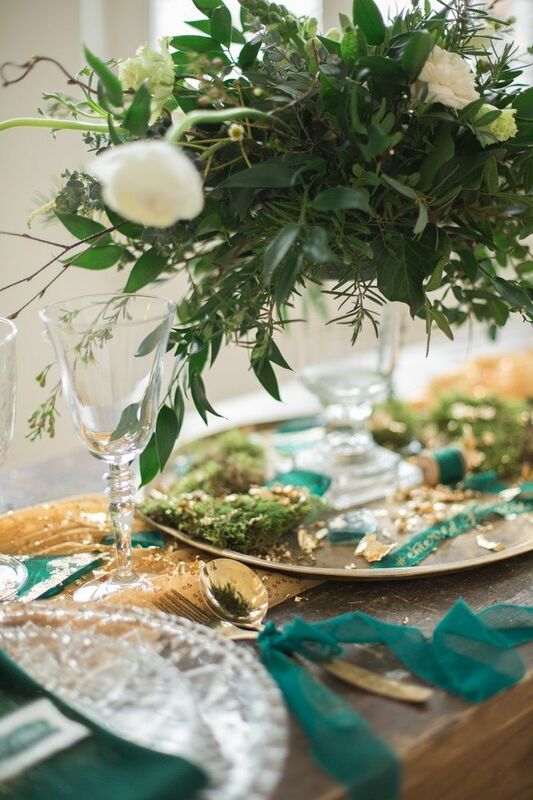 We see the rich emerald hue in the table settings and decorative and floral décor. 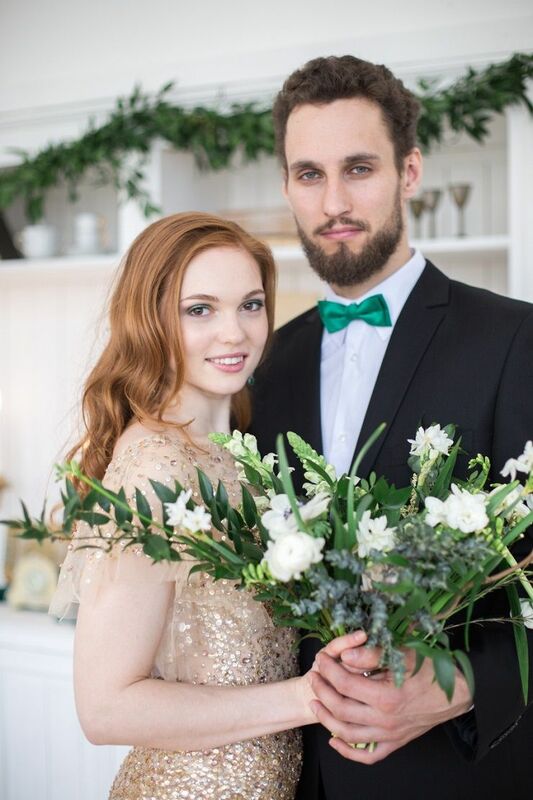 The groom’s emerald bowtie and the bride’s comb, ring and earrings accessories are in the same shade To compliment the green, they selected gold, yellow, brown and of course that beautiful red like Elizabeth’s hair. 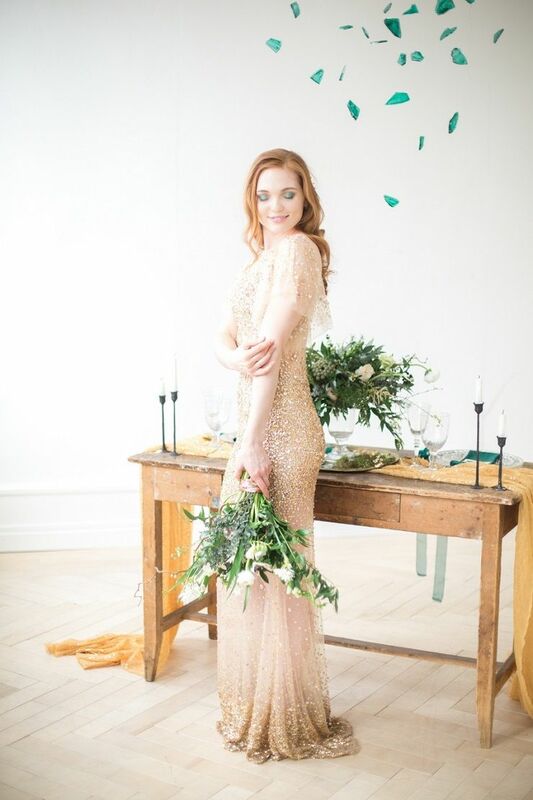 Plus, we love this unique glittering gold wedding dress from Be My Dress! 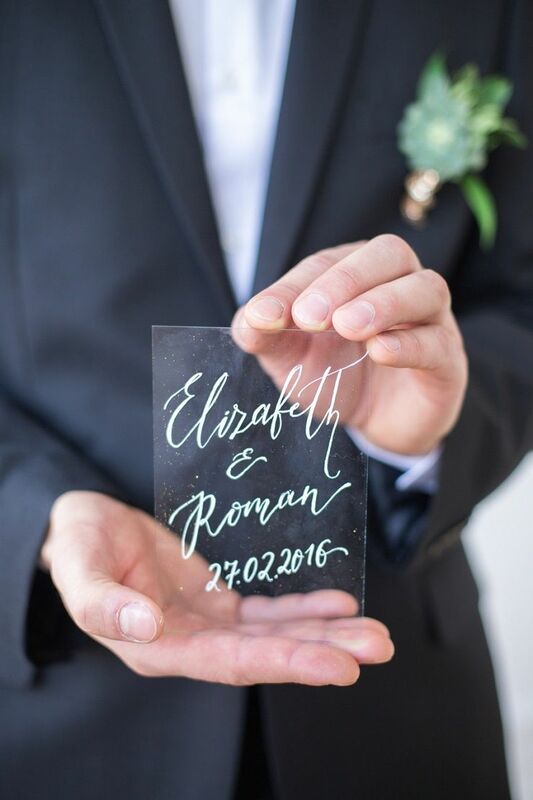 What a great way to command attention and bring light to a bride! 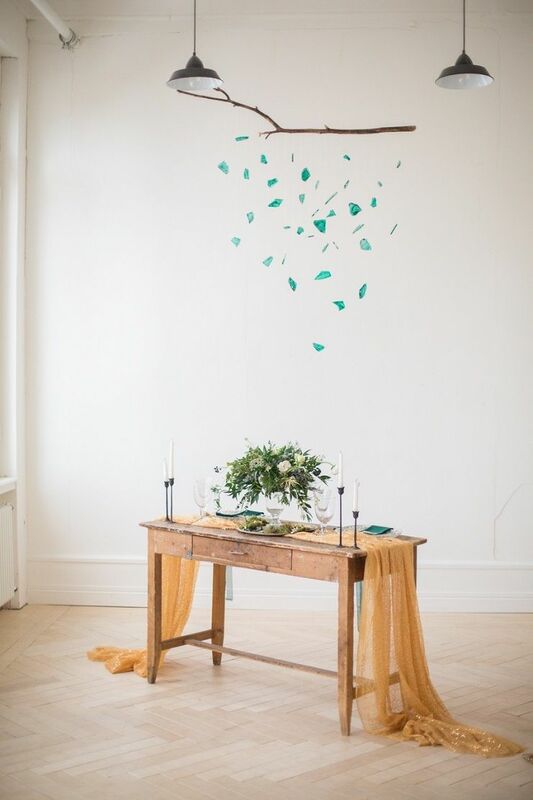 For the décor, a simple rustic wood table lined with a regal gold drape and a beautiful centerpiece serve as the room’s focal point. 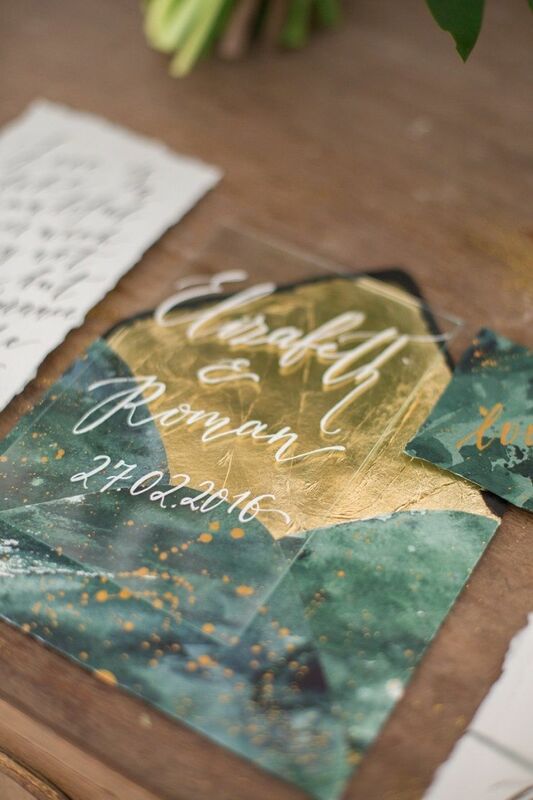 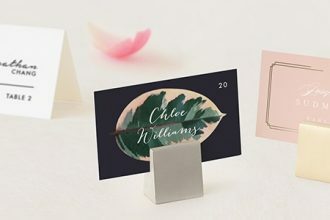 Look at the amazing invitation and calligraphy work (by Simple Creative Space) – the colour scheme of gold and green is perfect for this look, and the gorgeous calligraphy done on clear sheets adds a creative, elegant dimension to their paper suite. 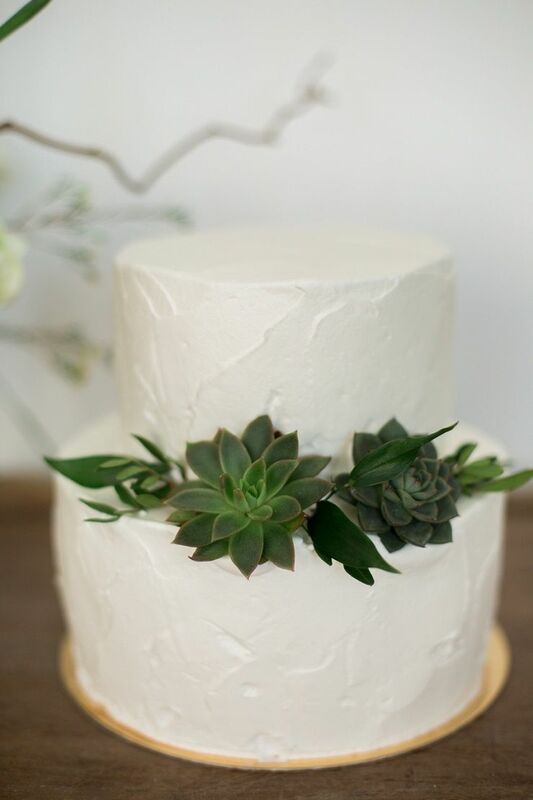 Throw in a simple white cake with beautiful crisp green succulents for décor (kudos to The Cake Workshop) , and altogether this photo shoot gets us dreaming of an Emerald Isle Fairytale wedding for sure! 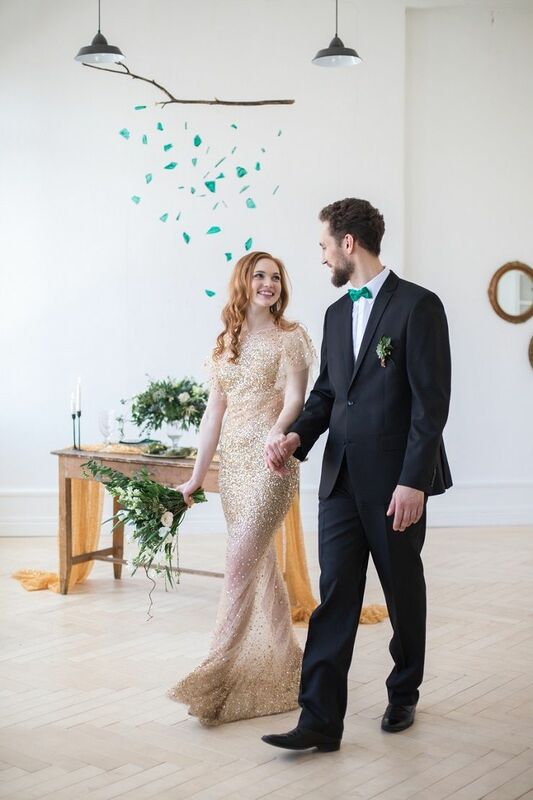 We love this unique glittering gold wedding dress! 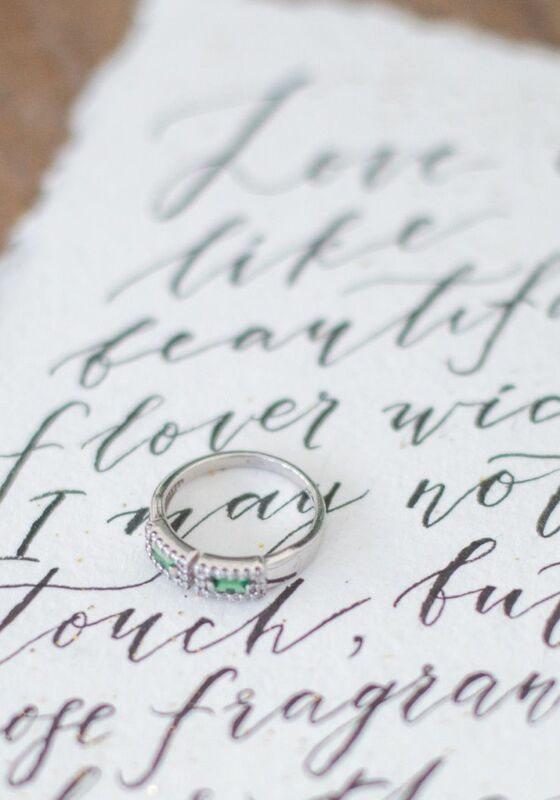 What a great way to command attention and bring light to a bride! 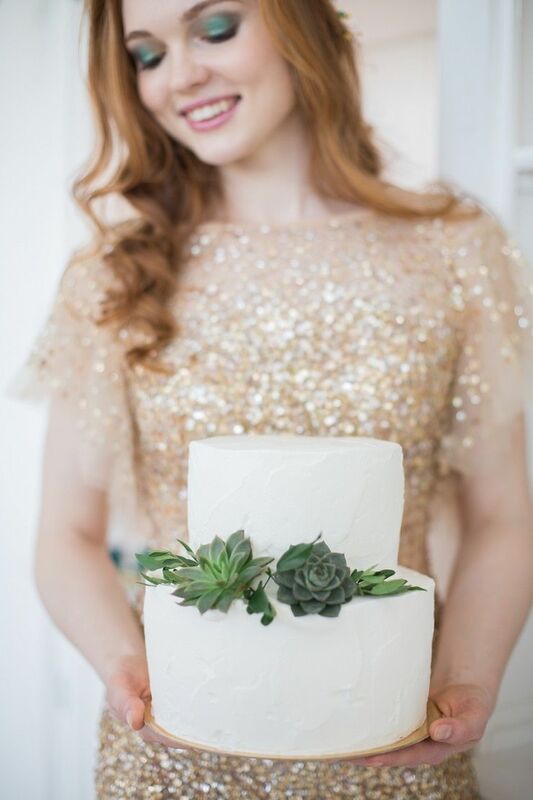 Amazing transparent glittering gold wedding dress. 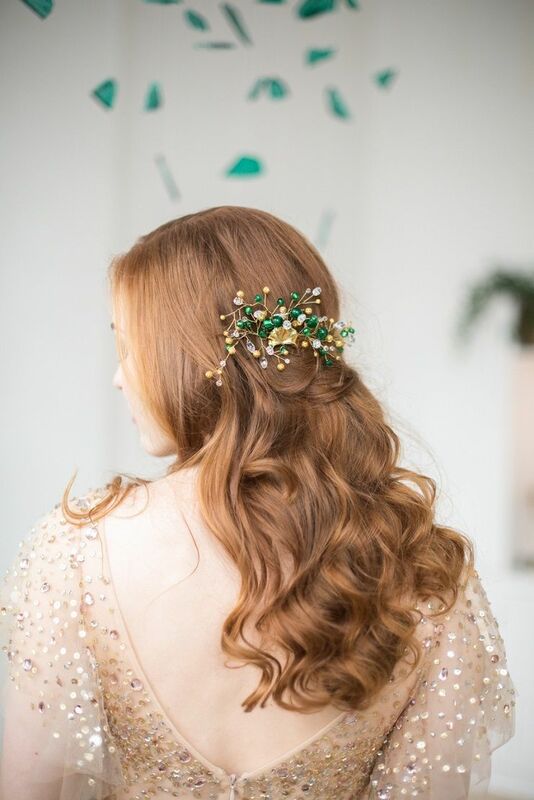 From Natalya Obukhova Photography…Sometimes when we hear Ireland we think about Emerald Island and when you look at Elizabeth and Roman you think about Ireland as well. 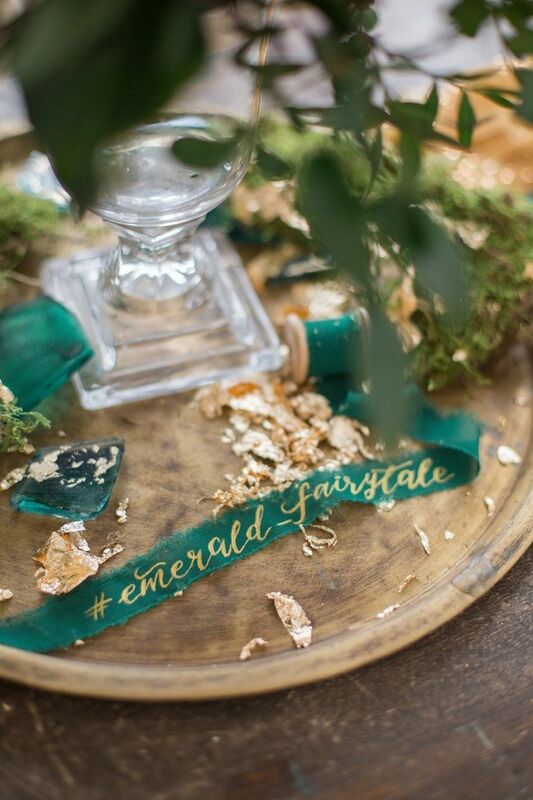 That is why emerald was chosen as a main color for this styled shoot which was called “Emerald fairytale”. 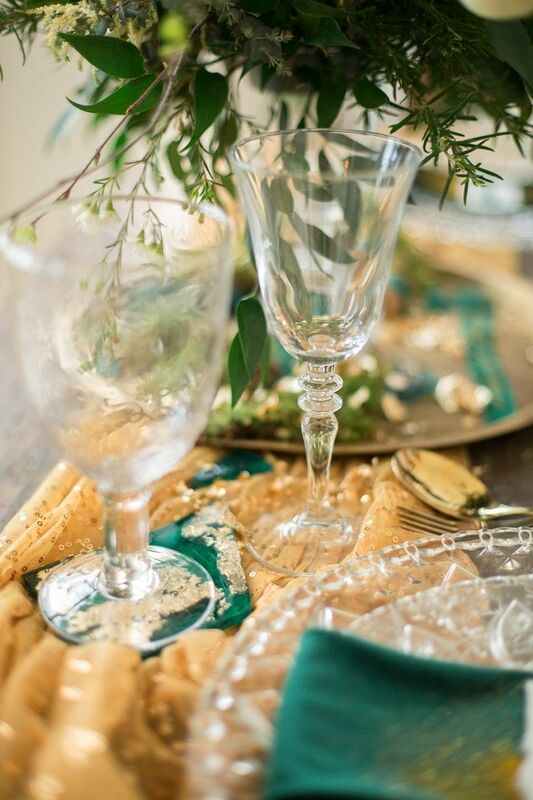 You can see emerald in details and table settings. 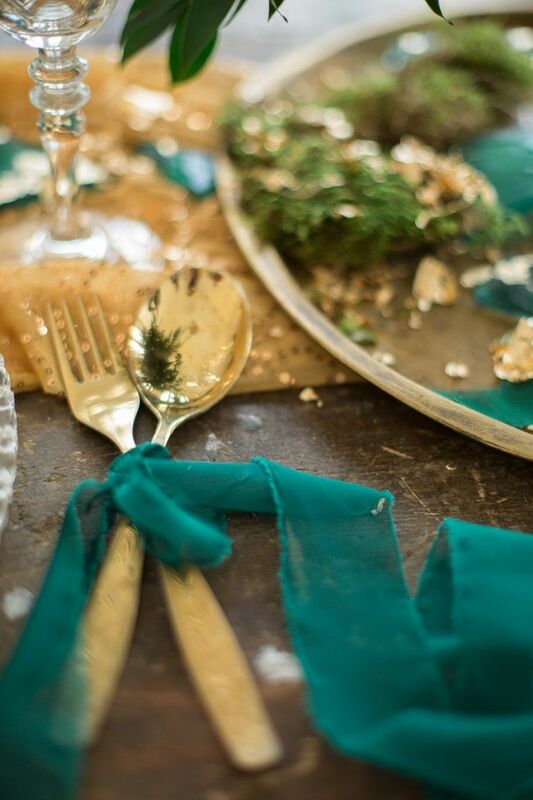 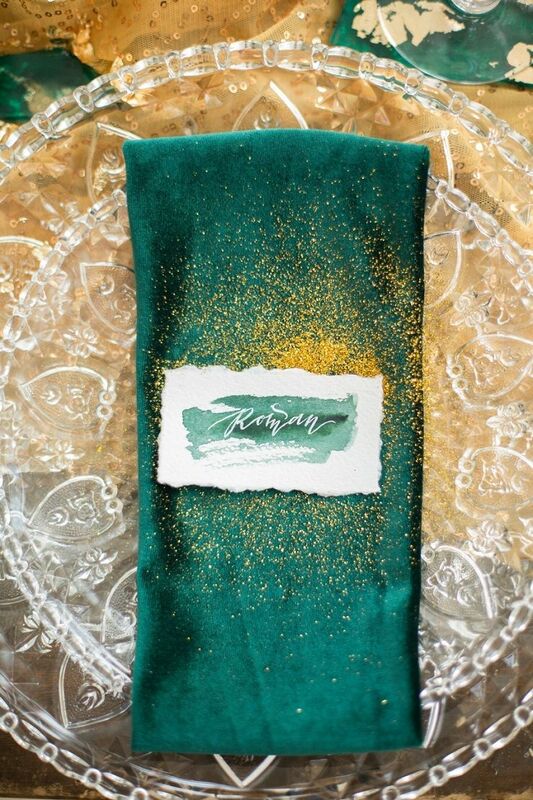 Emerald color harmonizes well with gold, brown, yellow, red and in our shoot gold was chosen as a comolementing color and you can see it in a beautiful dress, table setting and polygraphy. 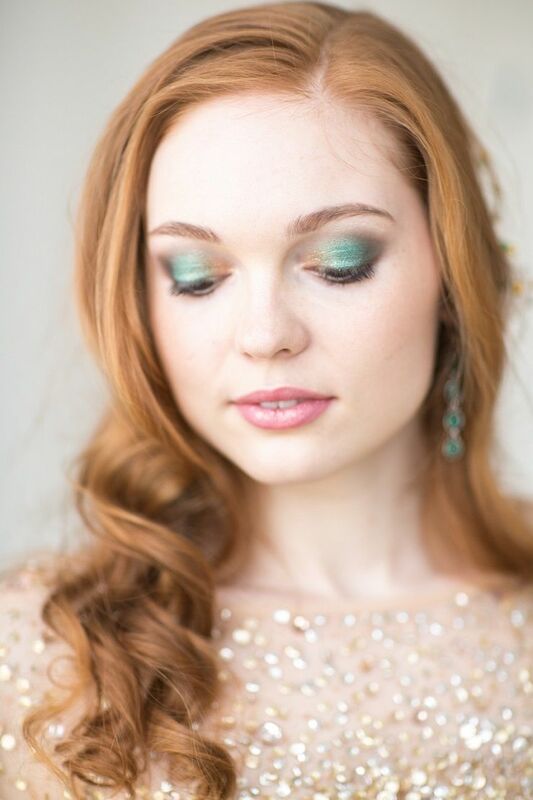 Besides Elizabeth has very nice red hair, so this cobbination ws perfect. 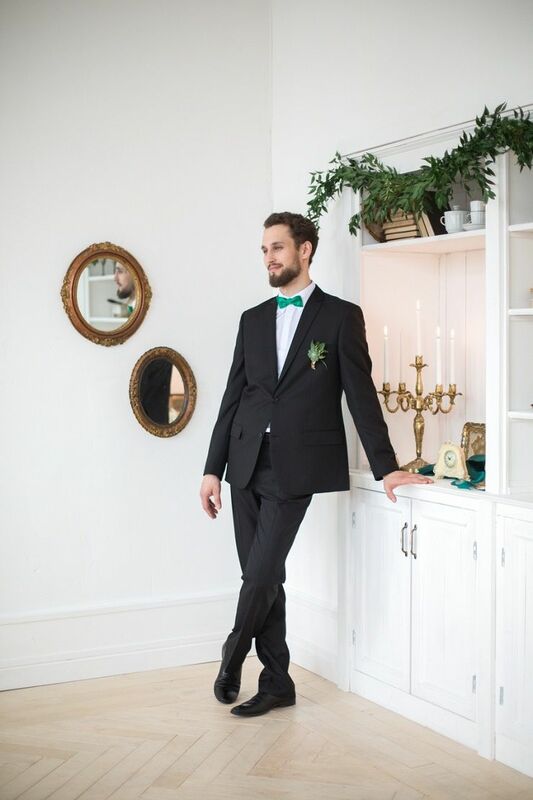 A black suit was chosen for Roman and it was completed by an emerald color bowtie. 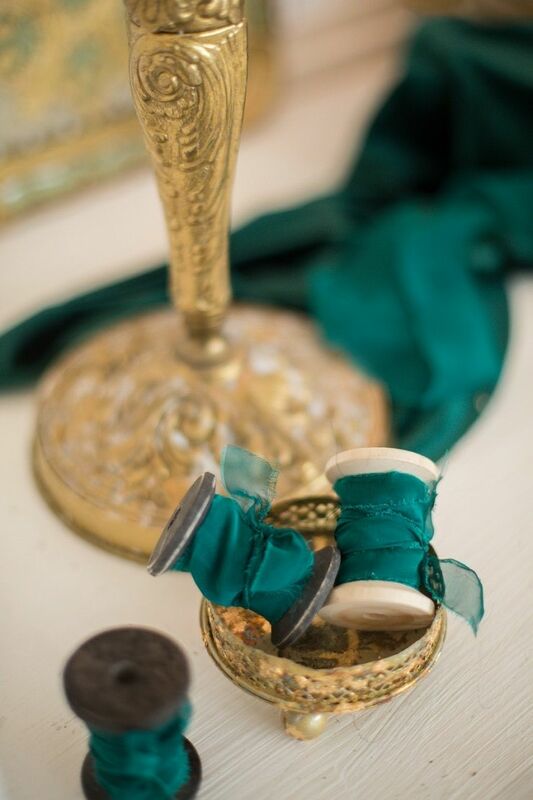 You can see emerald in Elizabeth’s accessories (earrings, ring and comb). 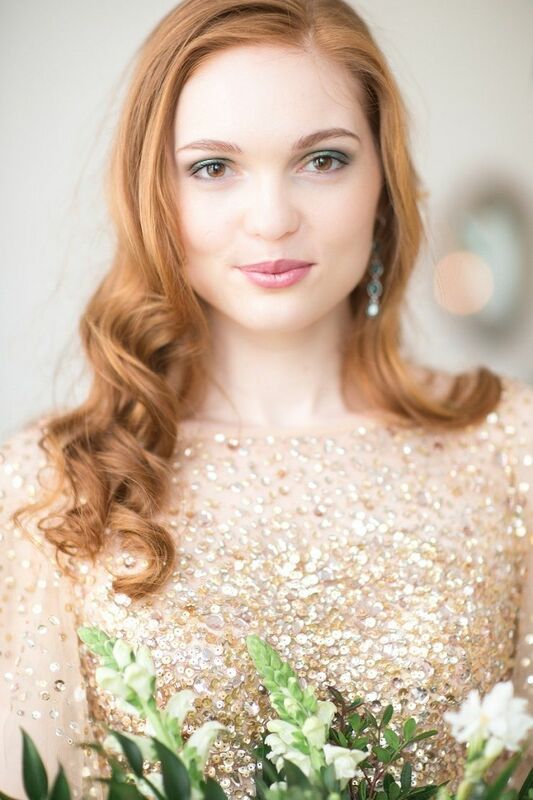 The romantic look of Elizabeth was finished with a bautiful gentle bouquet. 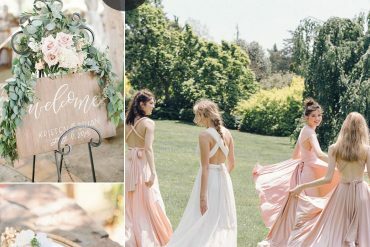 And for sure we wanted to show that tenderness between Elizabeth and Roman and you can see it – how he looks at her, how shy she is when he kisses her. 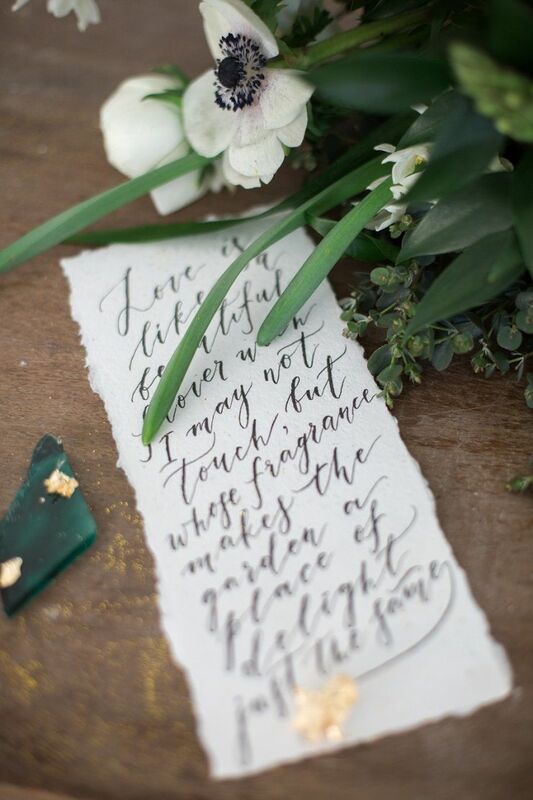 And all that is love! 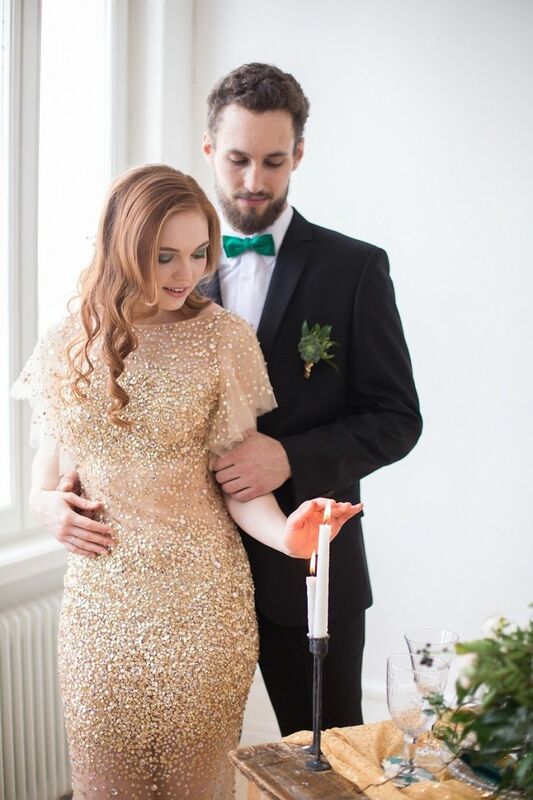 looking awesome in ultimate wedding dress, thank you for sharing the blog and images. 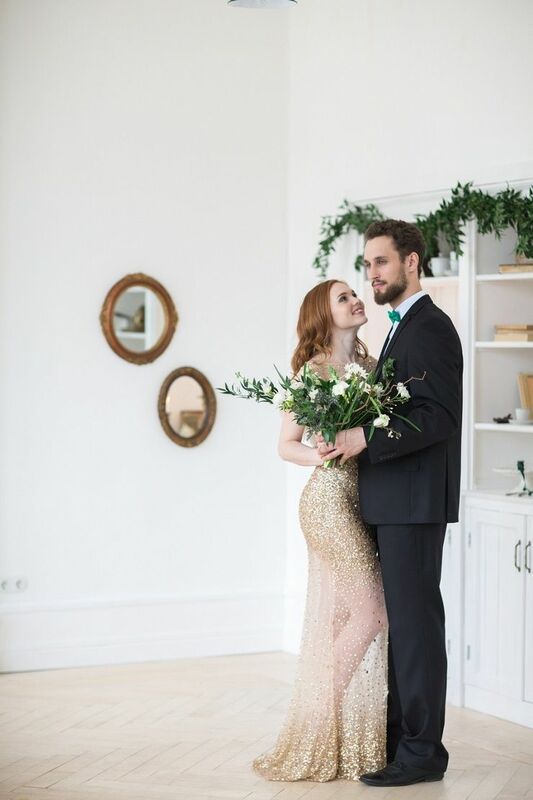 Ultimate dress up ,both are looking nice, thank you for sharing the images.